Doncaster rocker John Parr has been signed up to play the world’s biggest 80s music festival this summer. The singer-songwriter, best known for his global smash and US number one St Elmo’s Fire, has been booked to play Rewind North, a three-day feast of eighties music which will take place in Cheshire in August. John Parr will be performing at The northern show, which will be held at Capesthorne Hall on Sunday 6th August alongside other headline performances from Status Quo, Belinda Carlisle, Toyah, Junior Marvin's Wailers, Nick Heyward, T'Pau, Johnny Hates Jazz and many more. 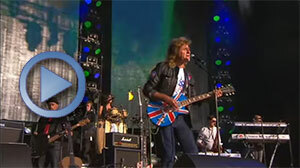 REWIND FESTIVAL - Official website.